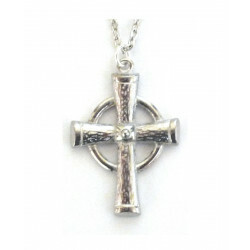 A refined pewter celtic cross, with its rhodium-plated chain. Celtic crosses used to be carved out of stone and made part of the Irish cultural and religious heritage. A refined pewter celtic cross, with its rhodium-plated chain. Celtic crosses used to be carved out of stone and made part of the Irish cultural and religious heritage. This piece of jewellery is delivered in a beautiful black satin case. Pewter cross and rhodium-plated chain.